By Paul Brient, CEO, PatientKeeper, Inc. Typical hospital EHRs force physicians to work in a way that is unfamiliar and counterintuitive. The technology is designed not to accommodate what the physician knows about treating patients (and has been doing for years), but rather to align with processes that exist deep inside the hospital. If technology was designed with more input from physicians themselves, their electronic workflow would be more intuitive; and if each system was personalized, it would more easily fit into a physician’s specific work style. Tailoring the user experience would allow each provider to review their patient lists and charts in the most convenient way for them. Typical hospital EHRs require extensive classroom training that often takes physicians away from their patients for days at a time. If anything demonstrates how non-intuitive most EHRs are, it’s the training required to use them. The solution to this problem is purpose-built systems designed specifically for physicians, with extensive input from physicians, which can integrate with a hospital’s other systems that already work well for their intended users. Physician-facing systems developed in this way would be more intuitive and would make lengthy training a thing of the past. From a usability perspective, clinical applications should take a lesson from the intuitive design of popular consumer applications like Kayak and Amazon. Physicians frequently waste time clicking around the hospital EHR to find all the information they need about a particular patient. That’s because the data may live in multiple systems or modules, which are structured in a process-centric way rather than a patient-centric way. By providing physicians with electronic tools to easily find the information they need, all in one place, they can become better problem solvers and spend more time delivering high-quality patient care. 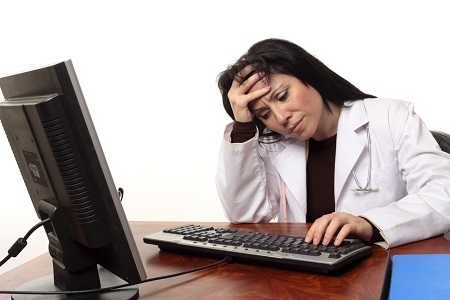 Many alerts issued by computerized physician order entry (CPOE) systems are unnecessary or irrelevant and fail to take into account the physician’s specialty, knowledge and patient situation. As a result, physicians become conditioned to ignore alerts — a condition known as alert fatigue. This can lead to relevant, perhaps critical, alerts being missed, putting patients at risk and defeating one of the main purposes of CPOE. By streamlining alerts and tailoring them to each physician, hospitals will more consistently put CPOE technology to its intended use and advance patient safety goals. Many computer systems make it easy for (and seemingly encourage) physicians to dump large amounts of clinical information into progress notes, complicating life for the next clinician who reads them. As a result, physicians are spending more time sifting through lengthy clinical documentation trying to discern the vital nuggets of information that is necessary to inform their care decision making. In order to combat this “note bloat,” documentation software should include customized note types, quick text and integrated links to clinical data, all of which (if used properly) can help physicians to create more meaningful and valuable documents. Physicians are the most expensive and limited resource in the healthcare system. Logic suggests IT should maximize that precious resource, not hinder it. As hospitals weigh their software options, the value of physicians’ time and expertise should figure prominently in any calculation. If a hospital’s computer system is not yet truly helping physicians do their jobs as best they can, IT must up its game. After all, physicians (not computers) are still the primary determinant of clinical outcomes. Read PatientKeeper’s e-book, A Promise Unfulfilled: Why Information Technology Hasn’t Improved Healthcare — and What It Will Take to Get There.